Sweet Southern desserts with a wonderfully fruity twist! Get your dessert on with this free eCookbook, Fantastic Fruit Dessert Recipes: 8 Southern Recipes for Dessert. Make delicious, Southern-inspired desserts with the great recipes included in this collection. You will find everything from pies to pudding. With such a great selection of desserts, it will be hard for you to pick just one to make, but if you print out this Southern recipes eCookbook, you will be able to come back to it again and again to create all of the amazing treats. Download your free copy of Fantastic Fruit Dessert Recipes: 8 Southern Recipes for Dessert today! Make dessert a little more guilt-free with the amazing, fruit-based Southern recipes in the collection. You are going to love these delicious, sweet treats. Better yet, you won’t feel guilty for indulging in them. All of the dessert recipes in this eCookbook are made with fruit so while they are still pies and puddings, they also have a healthy ingredient, which makes them better for you than a deep-fried doughnut. Fantastic Fruit Dessert Recipes: 8 Southern Recipes for Dessert is an amazing collection of tasty recipes that will satisfy your sweet tooth without compromising your healthy eating habits. These desserts are perfect for special occasions; your friends and family are sure to love everything from this eCookbook. You don’t have to wait for your birthday or a special occasion, though. These great desserts are also perfect for a weeknight treat. Make any and all of these awesome desserts when you download this amazing eCookbook. 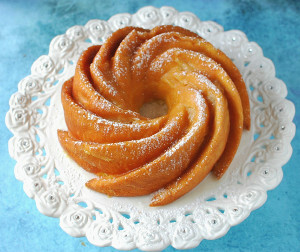 Peachy Lemon Bundt Cake (pg. 6, pictured) - Lemon cake mix is combined with a can of peach pie filling for a cake that is extremely rich and decadent. Baking this cake in a bundt pan makes for an extremely pretty presentation that is sure to impress friends and family alike. Skillet Fruit Slump (pg. 7) - This recipe combines strawberries, blueberries, and peaches for the filling, but you can substitute any fresh fruit you like. Nana's Fried Apple Hand Pies (pg. 9, pictured) - This hand pie recipe begins by cooking apples until they are tender and then mashing them to create the filling for the pies. The apple filling is spooned into circles of pie crust that are then folded over to create half-moon shaped pies. Mixed Berry Galette (pg. 11, pictured) - Even if you aren't an expert baker, you will be able to make this free-form pie with ease. A combination of fresh, juicy berries makes up the filling for this galette that can be enjoyed for breakfast or dessert. Grandpa DF's Banana Pudding (pg. 13) - This cool and creamy banana pudding is sure to become you family’s new favorite dessert. If you are looking to feed a crowd, this is one of the best Southern recipes you could make. Double Pineapple Upside-Down Cake (pg. 14) - This easy cake recipe features a thick, juicy layer of caramelized pineapple. Unlike many pineapple upside-down cake recipes out there, this recipe uses crushed pineapple instead of pineapple slices. Precious Cherry Hand Pies (pg. 16, pictured) - Sometimes all you need to satisfy your sweet tooth is a few bites of dessert. 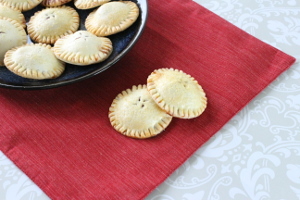 These cherry hand pies are made with homemade pie filling, but they couldn't be easier to make. Decadent Lemon Bars (pg. 18) - This easy lemon dessert also isn't overly sweet like some bars tend to be. It is a classic that family and friends will love. FaveSouthernRecipes' eCookbooks are free, downloadable recipe collections organized around a theme, such as fried chicken recipes, cornbread and biscuit recipes, our favorite Southern dessert recipes, and more. These eCookbooks are PDF documents that can be downloaded off our website, saved to your computer, and/or printed out for easy reference while cooking and baking. If you are having trouble downloading our free eCookbooks, visit our FAQ page here: How to Download our eCookbooks. Weekly emails with Southern recipes, tips, collection pages and more. This sneak peek of what this new eCookbook has in store for you has hopefully convinced you to download it free today. If any or all of these recipes appeal to you, click on one of the eCookbook icons anywhere on this page to download your free copy of Fantastic Fruit Dessert Recipes: 8 Southern Recipes for Dessert. You won't regret downloading this free eCookbook and printing its delicious recipes! Once you get your copy, you can either keep it on your computer or eReader, or print it out and keep it in your kitchen. No matter how you use your eCookbook, once you've tried even one of the recipes, you'll be glad you downloaded it. You can also download this book for FREE on iTunes! Download Fantastic Fruit Dessert Recipes: 8 Southern Recipes for Desert (for iPad readers).